These decadent truffles have the warm fall flavors of fresh apples and spicy cinnamon mixed with milk chocolate. They're coated in chocolate and topped with crushed graham crackers to mimic a delicious apple pie. Pour the apple juice concentrate into a small saucepan and add the cinnamon stick. Place it over medium heat to simmer until the concentrate is reduced by half. This process will take 10 to 15 minutes, but keep checking it until you have 1/3 cup of highly concentrated apple juice. Add the cream to the 1/3 cup of concentrated apple juice in the saucepan and bring this liquid to a boil. Meanwhile, place the chopped milk chocolate in a large bowl. Once the cream-apple juice mixture is boiling, pour it through a strainer over the chopped chocolate. Use a whisk to gently stir the chocolate until it melts and you have a smooth, shiny ganache. Press a layer of cling wrap on top of the ganache (this is the truffle mixture) and refrigerate it until it is firm enough to scoop and roll, about 2 hours. Once the truffle mixture is firm, but not solid, dust your hands with cocoa powder and roll the ganache into small 1-inch balls. You should get 40 to 48 truffles, depending on how large you make them. They should be bite-sized. Place them on a tray or plate. Return the balls to the refrigerator until they’re very firm, another 30 minutes. While you’re waiting for the truffle to firm up, crumble the graham crackers using a food processor or by rolling over them with a rolling pin. Then, melt the chocolate candy coating in the microwave, stirring after every 30 seconds to prevent overheating. Once the coating is melted and smooth and the truffles are very firm, use a fork or dipping tools to dip the truffles into the melted coating. Remove them from the coating and let the excess drip back into the bowl. Place the dipped truffle on a foil-lined baking sheet and while the chocolate is still wet, sprinkle the top liberally with the crushed graham crackers. Refrigerate the truffles to set the chocolate coating, for about 10 minutes. Apple juice concentrate is sold frozen in most grocery stores. 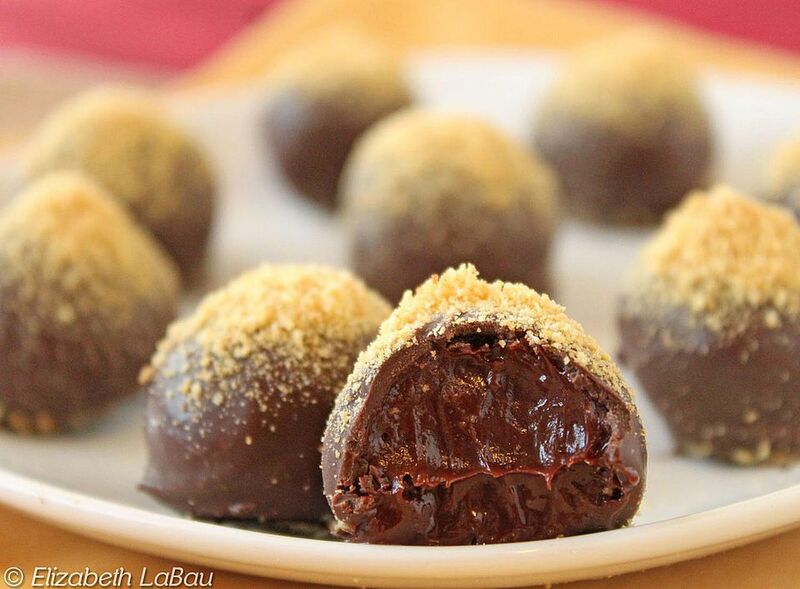 You'll want to defrost it prior to making these truffles. Just leave it out on the counter and it will quickly defrost. Serve the truffles at room temperature. If they are too cold, they will be hard to bite through and if they are too warm, they will become mushy. The truffles can be stored inside an airtight container in the refrigerator for up to a week. If you prefer dark chocolate, feel free to substitute that for milk chocolate. If you like a stronger cinnamon taste, add some ground cinnamon to the crushed graham cracker crumbs. For an extra decadent dessert, make the truffles on the smaller side and then use them to decorate a homemade or storebought chocolate cake. Just make sure the apple pie flavors work with the decorated cake.